Lightly beat eggs and milk in a shallow bowl. Mix flour, salt, black pepper, turmeric powder on a plate. Prepare bread crumbs on another plate. Pat dry the pork chops with paper towels. Dredge pork chops in flour mixture, make sure both sides are completely coated. Dip pork chops in egg mixture, then coated with bread crumbs evenly. Heat cooking oil in a skillet, fry pork chops in skillet about 3 – 5 minutes each side. Make sure it is fully cooked and the coating is golden brown and crispy. Do not overcrowd the skillet, do it in batches if needed. Remove pork chops from skillet and drain on paper towels to absorb excess oil. Rest pork chops for 5 minutes and serve. Fried pork chop is commonly served in restaurants. Japanese like to serve it with curry and rice. Serve it with pasta, salad, mash potato, French fries or potato wedges can be a satisfy meal. It is easy to cook it at home. 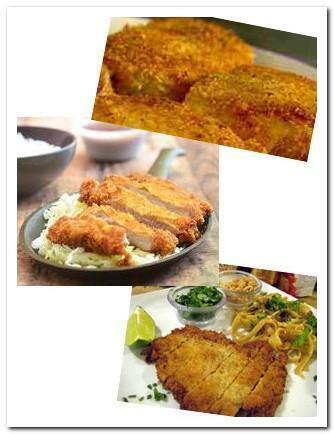 A delicious fried pork chop should be juicy inside and coated with a beautiful golden crispy crust.